This story is a Climate Desk collaboration between Mother Jones and High Country News. So, last year when Zinke indicated he might reduce its size, and Trump included OMDP on a list of 27 monuments put under review in April 2017, residents worried about what would happen. Was it possible that administration officials would allow drilling or mining across its nearly 500,000 acres of land? During a two-day visit to OMDP last July, Zinke “flew over the national monument in a helicopter” and met with ranchers and other monument stakeholders, The Las Cruces-Sun News reported. In “thousands” of emails from residents, Zinke’s office received an overwhelming message, said Rep. Bill McCamley, D, who lives in Las Cruces: “There was just zero want from anybody to shrink the thing.” OMDP was ultimately left out of any of the proposed changes. Baldy Peak and La Cueva are seen from Baylor Canyon Road. 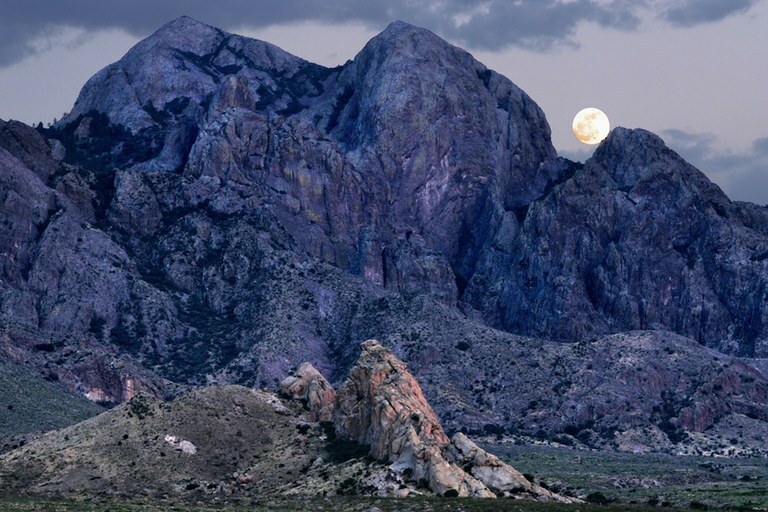 After the Organ Mountains were designated as a national monument in 2014, the range has become even more quintessential to the surrounding communities. Apart from the potential environmental impact of opening up these lands to development, the economic benefits public lands offer local communities have made this issue central in key congressional races in New Mexico, Montana and Utah. In New Mexico, for instance, more than 80 percent of voters polled by the Center for Western Priorities considered “public lands, parks and wildlife issues” important in the midterms. If that’s true, a historically Republican seat in the state’s second congressional district, which includes OMDP, could be flipped by 33-year-old Democratic candidate Xochitl Torres Small, a water attorney who has called public lands “a common ground between us all.” In other parts of the West, including a competitive house race in Montana and a long-shot bid in Utah, Democratic candidates are capitalizing on the national attention the administration has put on public lands in the hopes of swaying voters. Registered Democrats actually outnumber Republicans in New Mexico’s sprawling second district, which is 99.6 percent rural. A Democrat won here in 2008, and decades before, a Republican was elected as a write-in candidate when the district’s longtime congressman died after the deadline for the GOP to formally nominate a candidate. A swath of conservative Independent voters have made Republicans ascendant here, but the 2nd District is far from ruby red. After New Mexico Rep. Steve Pearce, R.,vacated the seat to run for governor, the nonpartisan The Cook Political Report included the district among its most competitive House races this cycle; the Report currently predicts the district to lean Republican. “I think all bets are off with that district,” said Dede Feldman, a former New Mexico state senator who now works as a political strategist. 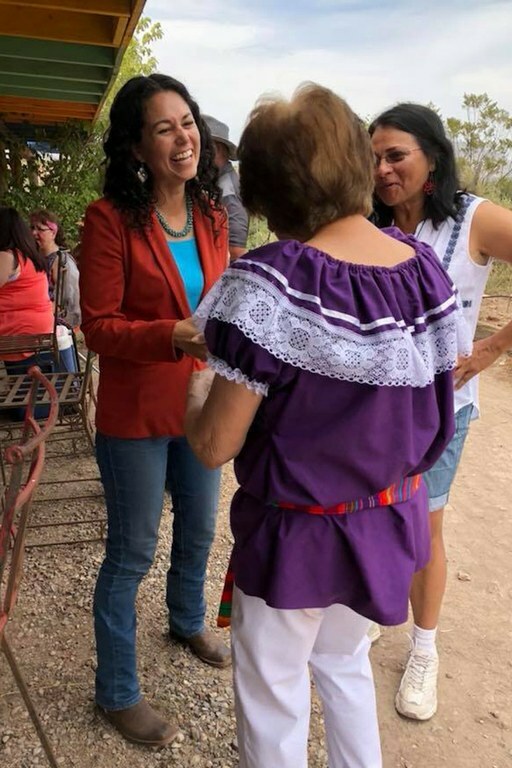 Democratic Congressional Candidate Xochitl Torres Small meets potential constituents in Tularosa, New Mexico, a few days after winning the democratic nomination. To win the open seat, Torres Small and her opponent, four-term state lawmaker Yvette Herrell, will need to bridge the divide between the district’s two major population centers: the sparsely populated, oil-producing Permian Basin to the east and Las Cruces in the west, where a solidly Democratic city council voted in April to get 100 percent of its municipal energy from renewable sources by 2050. A poll conducted shortly after the primary has Herrell leading by two percentage points. In February, the Democratic Congressional Campaign Committee added Torres Small to its “Red to Blue” list, a designation that supplies promising candidates with more funding and resources. With the backing of EMILY’S List, a national organization that supports pro-choice candidates, Torres Small has outraised Herrell by more than $400,000. The oil and gas industry spent more than $40,000 on Herrell's campaign, with major donations from huge petroleum firms like EOG Resources and Murphy Petroleum. Torres Small and Herrell differ on virtually every issue — immigration, gun control and health care in particular — but none more so than on access to public lands. Torres Small, whose husband proposed to her during a trip to OMDP, once said she knows parts of the monument “better than the back of my own hand.” Herrell, who won a State Chair of the Year award from the conservative American Legislative Exchange Council, is known more for her support of the oil interests that dominate the southeastern part of the state. In 2015, she proposed a bill that would have made it easier to transfer federal land to the states. Her critics said the bill would provide a giveaway to “private interests” that want to develop on public lands. A different type of access debate hovers over the race for Montana’s sole House seat, where Democrat Kathleen Williams hopes to unseat Rep. Greg Gianforte, R., to occupy the seat that was once held by Interior Secretary Zinke. Polling data shows that public lands, and access to them, will be important to voters in the midterms. In Montana, where hunting and fishing is an important part of the state’s heritage, counties with public lands attracted more new residents and spurred more job growth than counties with a smaller share of federal land, according to a Headwaters Economics report. In a University of Montana survey, residents were more supportive of wilderness designations this year than in 2014. Voters are more likely to reject legislation that would reduce those protections, with 54 percent of those polled saying they do not want to eliminate existing wilderness areas. 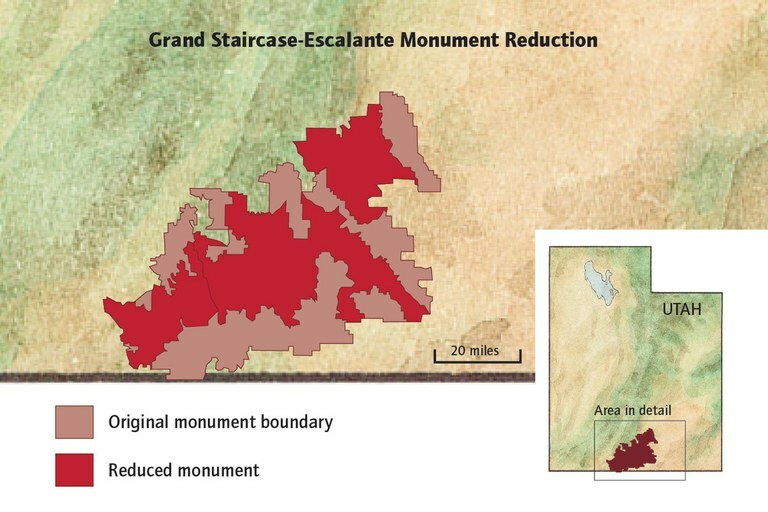 After the review of 26 national monuments, Grand Staircase-Escalante was reduced by 46 percent. Communities around national monuments rallied to show opposition to the changes. Ghorbani is considered a long-shot challenger in the district, which includes Escalante. The monument has driven economic growth in the district’s communities that have struggled with the boom and busts of the mining and timber industries. “It is one of the reasons why I think there is a message here,” Ghorbani, the Salt Lake City resident, said. While a central tenet in her campaign is to make healthcare more affordable, her platform is largely based on protecting the district’s public lands. Her mascot, after all, is a grizzly bear named Bart. Her opponent, Rep. Chris Stewart, who is up for his fourth term, backed the monument review, which ultimately ended in a reduction of Escalante; he’s projected to win the race with the district rated as “solid” Republican by The Cook Political Report. The importance of protecting public lands is still a hard sell for candidates like Ghorbani, where monuments can just as easily divide constituents who support resource extraction over recreation. But, the implications of the outdoor industry and job creation is becoming “more and more evident as time passes,” said Robert Keiter, Director of the Wallace Stegner Center for Land, Resources and the Environment. In 2016, for the first time ever, the outdoor recreation industry was included in the country’s GDP calculations. The 2016 findings were released in a government report in February, showing that the outdoor industry made up 2 percent of the national GDP. At $373.3 billion it was more than mining, oil and gas extraction combined. “It would be just about impossible for a politician to ignore that dimension of economic activity in the West,” said Keiter.